In case you missed it: A rare total solar eclipse will sweep the United States from Oregon to South Carolina on August 21—and it will be the last to pass over North America until 2024. Are you ready with travel plans, viewing glasses, or nifty science experiments to do during the event? If you’ve been procrastinating, time is running out. Get out from under that rock and acquaint yourself with everything you don’t know yet about the coming Great American Eclipse. Ira talks with Angela Speck, professor of astronomy at the University of Missouri, for this procrastinator’s guide to viewing it. When is the Great American Eclipse? The eclipse will travel from west to east, first “coming ashore” in Oregon at around 9:05 am Pacific Time (12:05 pm Eastern). It will leave South Carolina at around 2:49 pm ET (11:49 am PT). The eclipse completes its path across the United States in just over 94 minutes. It will be the first total eclipse of the sun visible to much of the continental U.S. in over 40 years! Where are the best places to see the Great American Eclipse? You’ll be able to see partial solar eclipses throughout most of the United States! Salem, OR; Idaho Falls, ID; Lincoln, NE; Kansas City, MO; St. Louis, MO; Nashville, TN; Columbia, SC; and Charleston, SC. But I’ll be able to see the eclipse from other places too, right? That’s right! Every part of the United States will be able to observe at least a partial solar eclipse. Have fun and don’t look directly at the sun without protection! Use certified eclipse glasses, solar filters, or use a pinhole viewer to observe the eclipse. Angela Speck is a professor and Director of Astronomy at the University of Missouri. She’s also co-chair of the American Astronomical Society Solar Eclipse Task Force. She’s based in Columbia, Missouri. IRA FLATOW: This is Science Friday. I’m Ira Flatow. I am getting all ready for Monday, August 21st when I’ll be in Wyoming watching the moon pass in front of the sun. It’s the first total solar eclipse to past coast to coast over the United States in 100 years. OK, maybe you’re sick of hearing about the eclipse. Maybe you’ve had your hotel room booked for a year– like I have. But maybe this whole eclipse is new to you, and you’ve been living under a rock. Or maybe you’ve just been procrastinating. You’ve got just three weeks, short weeks, and if you miss it your next chance to see a total eclipse in North America will be in 2024– seven years from now. But we’re here to help you. Whether you want to try to drive to the path of totality, or make the most of a partial eclipse. You don’t have to see a total eclipse you can still see the partial eclipse. We have some eclipse tips for you. Let me begin with my first guest, Dr. Angela Speck professor and director of astronomy at the University of Missouri in Columbia. She’s also co-chair of the American Astronomical Society’s Solar Eclipse Task Force. Welcome to Science Friday, Dr. Speck. ANGELA SPECK: Thank you for having me. IRA FLATOW: Let’s talk a bit about– remind people, this is crossing the US from Oregon to South Carolina. Correct? ANGELA SPECK: That’s right. The shadow of the Moon crosses 14 states total, and the entire US gets to see a partial. IRA FLATOW: And what makes a total so different from a partial? ANGELA SPECK: Well, so when you have a partial eclipse there’s still enough sunlight that it doesn’t go dark. Even if you have 99.9 percent of the sun covered with the moon there’s still 0.1% showing. That’s a thousandth, and that means it’s still a 1,000 times brighter than the full moon. And that means that the sky doesn’t go dark until it’s completely eclipsed. So for people who are close to the path of totality, they should try to get to it because 99% of the Eclipse is not 99% of the experience. IRA FLATOW: Wow, just that 1% really makes a difference. IRA FLATOW: Where are you going for the eclipse? ANGELA SPECK: Well, I live on the path of totality. The University of Missouri is right in the middle of the path in Missouri. So I will be right here in Columbia, Missouri. IRA FLATOW: Suddenly a lot of guests are showing up at your place. ANGELA SPECK: You know, one of the things that we’ve done as a task force, and locally, is try to figure out how many people are going to come, and that’s really hard. I’m pretty sure half of England’s coming to my house though. IRA FLATOW: I’ll bet. And you don’t want to look at it with the naked eye. At least until it becomes total, correct? ANGELA SPECK: That’s right. Like I just said, even with a tiny bit of the sun showing you still have so much sunlight that it’s too bright, and you can’t look at it. So you need to either use a pinhole projection, which the older listeners will remember doing. Or you get the Eclipse glasses, and then you can view it because they only let in a millionth of the light so it’s completely safe. IRA FLATOW: Let’s go to the phones to Ben in Frederick, Maryland who wants to know more about it. Hi, Ben. BEN: What type of glasses would be the best to use? ANGELA SPECK: So, you absolutely should not use regular sunglasses. Sunglasses help with what gets bounces off of other things, like bounces off the ground. But you still can’t look at the sun with those. What you need to get are proper eclipse glasses. They have a little symbol on that says ISO and looks like a globe. And actually, at eclipse.aas.org we have a list of all the suppliers. They are currently available in lots of retailers, and a lot of libraries have got them for free. And some cities have got them for free. So, if you look around, they shouldn’t retail for more than about $2 a piece. But you absolutely want to get these because it’s the only safe way to look directly at the sun. IRA FLATOW: You know, Ben, if you go to your Maryland Science Center in Maryland Museum I’ll bet you they have in the tchotchkes shop at the end they’ll have some glasses for you to get. Are you going, Ben? BEN: Yeah. We are going to look at it from North Carolina. IRA FLATOW: Wow. Wow. Well, good luck to you. You’ll remember it the rest of your life. And seven years from now there’s another one. IRA FLATOW: You’re welcome. It’s good to get started young on this, isn’t it? ANGELA SPECK: Absolutely. This is such a great opportunity to get not just kids, but everybody, excited about science. And all those kids that get to see it are hopefully going to be more interested in science as a result. IRA FLATOW: If you don’t have the glasses you mentioned a pinhole camera. ANGELA SPECK: Right. So, basically, any time you make a little hole and light passes through it, you can get an image. You probably did it as a kid. It was a shoe box, or something like that, and you make a little hole and the light passes through it and it makes an image on the other side of the box. Now, it doesn’t have to be a box. There’s all sorts of ways of doing it. And, in fact, even something like a colander– so, you know, for straining pasta– that’s got lots of holes if you hold that up during the partial eclipse you’ll get images of the partially eclipsed sun through each of the holes, so it makes a cool pattern on the ground. It also means that trees do a– because they have gaps between the leaves– so if you look at the shadows on the trees during the partial eclipse you’ll see all these crescent suns. So, it’s really something that there’s lots of ways to improvise it. It’s not quite the same as getting to look at it with your eyes directly with the glasses on. But you still get to see what’s going on. IRA FLATOW: I remember when I was a kid walking home from school and not realizing there was a partial eclipse going and seeing all these little half moons on the ground walking through the trees. Let’s go to Nick in Hampstead, New Hampshire. Hi, Nick. NICK: Hi, happy eclipse month. NICK: I have a question about Bailey’s beads. We’re planning on being in South Carolina, we’re in the path of totality. And my question is, should we be able to see Bailey’s beads at that point? Or is it only at certain points along totality that you’re able to see those? ANGELA SPECK: So, let me explain what Bailey’s beads are for people who aren’t familiar. One of the things that people don’t think about is the fact that the moon is not a smooth orb. It has topography. It has mountains, and valleys, and craters. And so as it’s moving into place as it’s starting to block out the sun, just at the point where it’s almost blocked out the last bit of the sun that you get to see. The valleys on that side of the moon where it hasn’t– the valleys are still letting in sunlight but the rest of the sun is missing. And so you get what look like little beads where the sunlight is coming through those valleys. And you get the best view as close to the center of the path as possible. It doesn’t matter where you are along the path from Oregon to South Carolina. But you get the most time and the best view of Bailey’s beads if you are close to the center of that path. IRA FLATOW: One fascinating thing to me about an eclipse, a total solar eclipse, is that everything is so lined perfectly. The size of the moon. The distance from the Earth. So that the moon just covers the disk perfectly for the eclipse. ANGELA SPECK: So one of the things that– that’s certainly true. But, actually, the sun and the moon and the Earth line up twice a year, and less than half of them give us total eclipses. And it’s because, in fact, more than half the time the moon is too small. And we get what’s called an annular eclipse where you can still see the edge of the sun. And so it is really cool that the size is about right. And, in fact, the moon is ever so slightly bigger than the sun so it actually blocks out just a bit more than perfectly. IRA FLATOW: You don’t mean in real time it’s big. It’s just appears bigger. ANGELA SPECK: Right. So, the way you can think about it is that the moon is 400 times smaller than the sun. But it’s 400 times closer. So it’s apparent size in the sky is the same. IRA FLATOW: And, in fact, because the moon is moving away from the Earth constantly, is it not? The Eclipse that maybe Aristotle saw a couple of thousand years ago is not the same eclipse that we’ll be seeing. And there will soon not be an eclipse a few thousand years from now? ANGELA SPECK: Right. So, I think the change is very small. The moon is moving away from us, but it’s a very tiny amount. A centimeter per century kind of scale. And what that means is that, yes, eventually we will not have total eclipses anymore. We’ll just have annular eclipses. And it means in the past the moon would have been bigger so, actually, when it’s at its closest point and there’s an eclipse it would block out more of the corona, which is the atmosphere we get to see during the total eclipse. So I like to think about it as, dinosaurs wouldn’t have seen the same things. If we go back to Aristotle it’s probably not quite long enough ago to be a big difference. But we go back to the dinosaurs, they actually would have had a very different view of eclipses than we do. IRA FLATOW: Would have had a tougher time with their glasses, too. Let’s go to Amy in Manhattan. Hi, Amy. Amy, are you there? Amy? No? No Amy? OK, well, she wanted to know, how does she get to the path if you really can’t afford to get to a hotel. Can you go to other places? And I’m thinking you just drive to a parking lot of Safeway or something like that. And you stand there and watch it for a few minutes. ANGELA SPECK: Right. So, I mean, I think it depends on how far you need to travel. So you’re going to have people who live where it’s less than a day’s drive. You know, 2/3 of the country actually lives within an easy days drive. Actually, the whole continental US lives within a long day’s drive. So if you’re willing to drive there and just hang out and then leave again, you can do that. It is going to be busy. You want to leave early enough. You can’t just give yourself the normal amount of time it would take to drive say 200 miles. But the issue is going to be things like sanitation, food. If you’re going to do that make sure that you carry water in your car. Make sure that you carry some food. Because I live in a college town and we can’t get to eat out on homecoming weekend or graduation weekend because it gets too busy. And this is going to be so much busier. So for people who haven’t booked– the other thing is that there are people who have been living under a rock and don’t yet know, or have only just found out that this is such a big deal, and they’re starting to look at Airbnb. And so even though we think of it as being completely full from the point of view of accommodation, there may well still be some places where people have either, booked more than one spot and they’re waiting to see where they want to go, or people haven’t decided to rent out of room until just now. So it’s worth looking around at what is available. IRA FLATOW: Let me bring on another guest. One of the founding members of the Science Friday Science Club because the club is back with this month’s challenge. And it’s to explain the eclipse. Ariel Zych, Science Friday’s education director. IRA FLATOW: Welcome back. Tell us about this project. ARIEL ZYCH: Thanks for having me. We’re really excited about getting people excited about the eclipse. As you probably know, the best way to get the word out about something is to tell other people about it yourself. Person to person communication is a really important way to communicate science. So if you know about the solar eclipse that’s happening, if you have information about the solar eclipse, we want you to help us get the word out. And you can do that any way. You can make cool gifs. You can make memes. You can send photos to your loved ones of postcards of where you’re going. You can draw maps. You can make signs. You can do a dance. You can write a song. Any way that you can help us get the word out about the eclipse, we want to hear it. IRA FLATOW: And what– do they then get back to us with this? ARIEL ZYCH: They do. At sciencefriday.com/scienceclub there’s a form where you can submit your awesome announcement about the eclipse. There’s also a great eclipse hashtag, #eclipse2017, which everyone’s using. Share it there. Share it with the #scifrisciclub. As we get really amazing and compelling announcements for the eclipse we are going to share them out because we’ve only got a few weeks. IRA FLATOW: You betcha. This is Science Friday from PRI, Public Radio International. I’m Ira Flatow talking with Ariel Zych and Dr. Angela Speck about sharing information. This is a great way to crowd-source stuff on this event. ARIEL ZYCH: It totally is. All of the great things that Dr. Speck was just talking about that people might not know about. What are Bailey’s beads? Why should I go stand under a tree if I’m not even in the path of totality? What am I going to see that’s going to be so special? Those are the types of important communication challenges that we face in the next 18 days. Is that where we’re at, Dr. Speck? ARIEL ZYCH: Oh my goodness, so time is ticking. If you know about the eclipse, tell other people about the eclipse. Because you’re probably going to do in a really interesting and cool way that we wouldn’t think about it. ARIEL ZYCH: Absolutely. As this eclipse is happening, certainly check out eclipse2017.nasa.gov for ways that you can collect data during the Eclipse. If you want to collect audio for the eclipse soundscapes project. If you want to collect observations of wildlife animals, wildlife behaviors for Cal Academy of Sciences citizen science project. Go for it. But in the time leading up to the Eclipse, one of the most important things that you can do as a lover of science is to tell other people about it happening. IRA FLATOW: Dr. Speck, you agree? ANGELA SPECK: Oh, absolutely. It’s all I do right now. IRA FLATOW: And, as you say, there may be late adopters here, and they’re going to flood the place. ARIEL ZYCH: Completely. And there’s a lot of other things to think about, too. Like what about people who maybe don’t speak the English language and aren’t reading the newspaper because they can’t. If you speak another language take this chance to make another poly-linguistic invitation to see the eclipse. 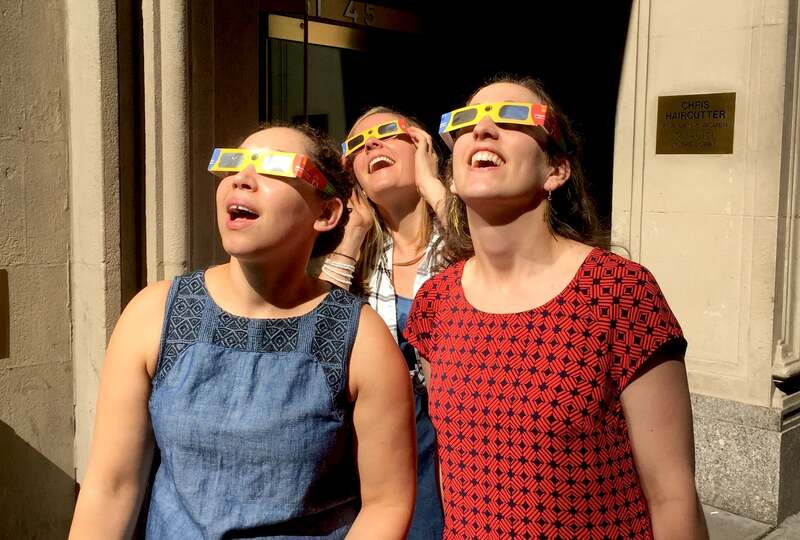 I was really impressed and delighted to find that a group of scientists have been putting together a visually impaired accessible app to view the eclipse. It’s also with the Eclipse Soundscapes Project it’ll be available on Monday. So that even if you can’t see, you can experience the Eclipse in real time. So these are all great examples of ways that you can apply yourself to helping the entire nation share in this incredible science experience. IRA FLATOW: And if you want more information, you go to our website at sciencefriday.com/eclipse we have a compendium of all the info you want about the eclipse. That’s sciencefriday.com/eclipse. Let me thank my guests. Ariel Zych, Science Friday’s education director. ARIEL ZYCH: Thanks for having me. IRA FLATOW: Very psyched for this. Dr. Angela Speck, professor and director of astronomy at the University of Missouri in Columbia. She’s also co-chair of the American Astronomical Society Solar Eclipse Task Force. Good luck to you. Happy viewing, Dr. Speck.